SEVEN (07) persons met together on May 14 to learn—and share their knowledge of personal finance and investing forthe future. The chapter meets in Sacramento on the Second Saturday of each month at 10:30 AM to 12:30 PM. Where should you put your money to best meet future goals? This is a straight forward question without an obvious answer. The number of choices one has in savings and investment vehicles, and the rules that govern both individual retirement and taxable accounts, employer retirement plans, securities sales, brokerage accounts, health savings, Roth IRAs, SEPPs and 457 plans, impacting allowed/required withdrawals, distributions to heirs, tax rates and reporting, etc., make this decision a difficult one. Not to mention the fact that the rules change—every year! To reduce uncertainty, acquire a reasonable understanding of the principal tax-advantaged (IRAs and employer plans) and taxable accounts that are available to you and specify these in your Investment Policy Statement (IPS) / financial plan. In determining how one should allocate investment and savings in these accounts, strive to achieve the lowest total tax liability while meeting ones own objectives, managing known risks and complying with the tax code and securities law. The cost of investing is one of the determining factors in building a portfolio that will meet your future needs and wants. Taxes are a significant portion of these costs and therefore merit attention. Savings rate, however, remains the most important factor. Forum member cmr86 spoke on ‘Taxable vs. Tax-advantaged account’, during the May 14 meeting. These notes are based on the materials provided to me, primarily the PowerPoint slide set. Any errors are very likely my own, commissioned during rewording to reduce content or in summarizing. 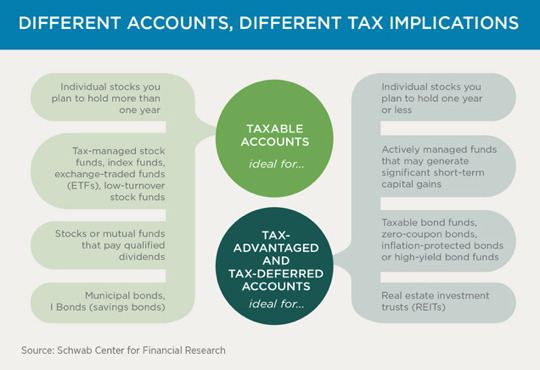 Compare the advantages / disadvantages of taxable & tax-advantaged accounts. Selection criteria, per cmr86, hinges on knowing or correctly predicting one’s tax bracket in retirement (if it’s expected to be lower, favor the IRA; if higher, then favor the Roth). Information was presented on ‘Back Door’ Roths, SEP and SIMPLE IRAs, employer sponsored payroll deduction plans 401(k), 403(b), 457 and some of the rules associated with them; descriptions of the funds available to participants in the federal government’s Thrift Savings Plan (TSP), and definitions, along with some of the eligibility requirements, for participation in Health Savings Accounts (HSAs) and 529 education savings accounts. Municipal bonds and cash accounts were also discussed. 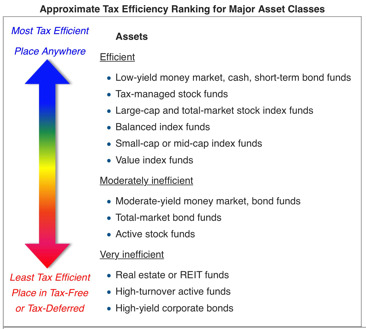 A chart highlighting the advantages and disadvantages of taxable brokerage accounts was shown at the conclusion. ¹ “If you’re daring [… invest in] a Traditional IRA to spare yourself some money from the tax man”. How does a deduction taken for an tIRA contribution compare with a pre-tax 401(k) contribution, which also provides immediate tax relief? The wording implies that one must wait until retirement to convert a traditional IRA into a Roth IRA but it may be clearer to phrase it as, ‘If one expects to be in a lower tax bracket… at any time prior to taking RMDs, one should at that time consider rolling over tIRA into a Roth IRA.’—and I would add, the earlier the better, preferably in a down market than at the peak, and subject to having sufficient dollars available from one’s earnings or savings to pay the tax. Roth IRA conversions were discussed at some length following a presentation on the subject by “chasingbutterflies” during our meeting on April 9, 2016. Meeting attendees can read the transcript, which contains much practicable advice. If I understand correctly—and it’s possible that I don’t understand—there appears to be a philosophical disagreement among some financial / retirement advisors on the general recommendation of the best time to pay tax on deferred accounts.